Dealpath is a cloud-based collaboration and project management platform for commercial Real Estate. Successfully manage deals, track transaction pipeline, and automatically generate reports. 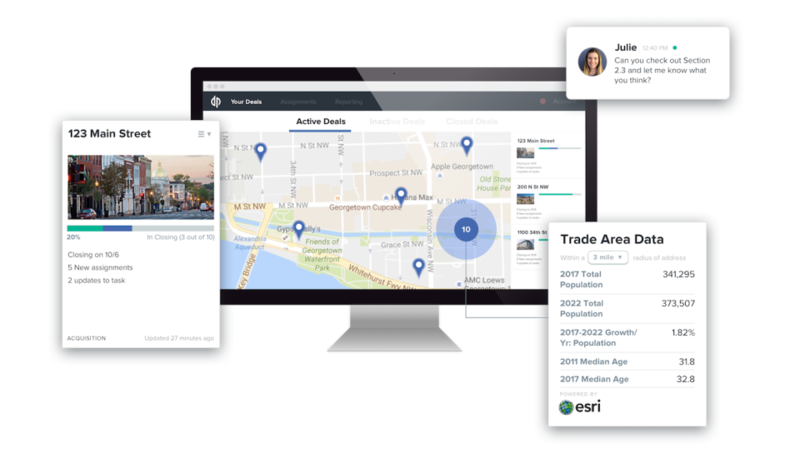 Additional features include smart alerts/notifications, file storage, search, data export, demographic data, and customizable workflow templates. Great Software. Great Customer Service. Pros: The software has great functionality and is very easy to use. I love how searchable it is. It allows me and my team to find the information that we need quickly and efficiently. We can easily update information to keep everything as accurate as possible and up to date. Cons: There are two things that I do not like about the product: 1) I do not like the functionality of uploading files. It takes way too long, and I do not like that you have to assign files to a task; 2) Grouping properties into assemblages is not great. I had to invent a new naming constraint to make it work for my team. Overall: This software enhances the communication among the members of our Acquisitions team and our stakeholders. It allows us to share information, while constantly checking for accuracy. We are able to have the most accurate information on our projects available at our fingertips no matter where we are. Extremely helpful customer support and best deal platform I've experienced thus far in my career. Pros: Best deal tracking / database / DD tracking list software I've used all in one place. The simple design and structure also allows the more technology challenged team members to benefit from the platform. Cons: Difficult to delete multiple files from a single task all at once. Folder structure does not maintain integrity when doing a bulk-download, and the platform sometimes has difficulty uploading folders that contain other sub-folders within it. Overall: Streamlines DD process and provides a secure database that is accessible anywhere with internet. Dealpath's flexibility and willingness to make custom improvements to the platform is outstanding. Pros: It's the only software we have found that combines a due diligence platform, a cloud-based file platform, and a deal-tracking platform all in one program. Cons: Would be great if you could save files from emails direct to dealpath. Also, would be helpful to email files straight out of dealpath. Overall: Better communication during due diligence process and ability to provide third parties access to our due diligence checklist/files in real time. I find dealpath to be very user friendly! Never had a problem using it. Pros: The layout is easy on the eyes. I love that you can have more than one window open at once, really makes it easy to multi-task. Cons: There is no calendar function. I would like if I could see all the upcoming dates on a calendar. The dealpath maintenance notification pops up way too often. If I click the X it comes back many more times.